Leave the train station towards ‘Washingtonplatz’ rather than Europaplatz. Cross the Spree and head towards the ‘Reichstag’ and the adjacent government buildings. It is a quick 5 – 10 minute walk. To your left you will see the Charite Hospital, in the background you can see the television tower. From the Reichstag continue towards the ‘Brandenburger Tor’, leaving the Tiergarten park to your right (we’ll come to that in a moment, so ignore it for now). This should take another 5 minutes or so. From the Brandenburger Tor head a little further to the ‘Memorial to the Murdered Jews of Europe’. I am not recommending this as a great photo opp (although it really is), I’d rather advise you go and reflect on history and just experience the place. I would be surprised if it didn’t send shivers down your spine. 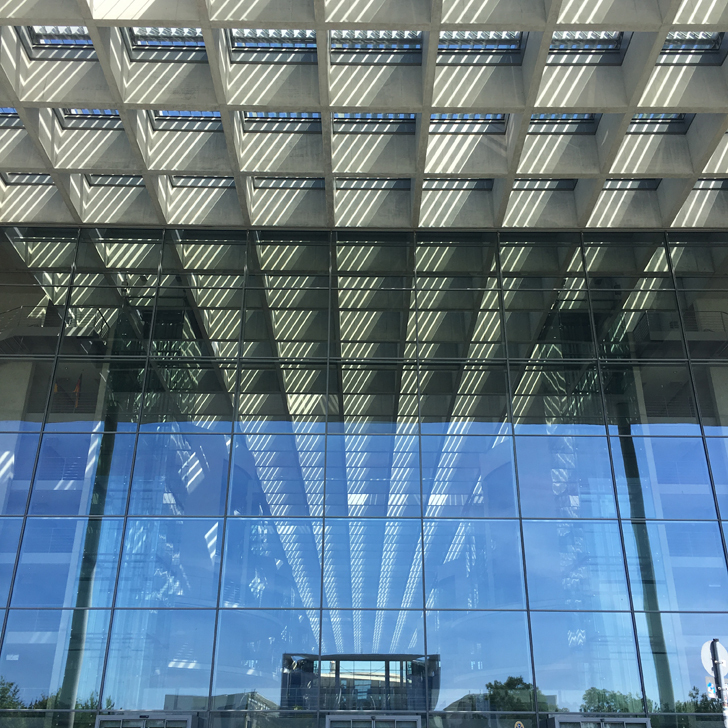 If you are good on foot, you can head down even further and include Potsdamer Platz into your tour. Or the Checkpoint Charlie, which is also fairly nearish (however do remember that you will need to walk it all back again, so keep an eye on your watch, if you do have a train or flight to catch). But let’s not overdo it. 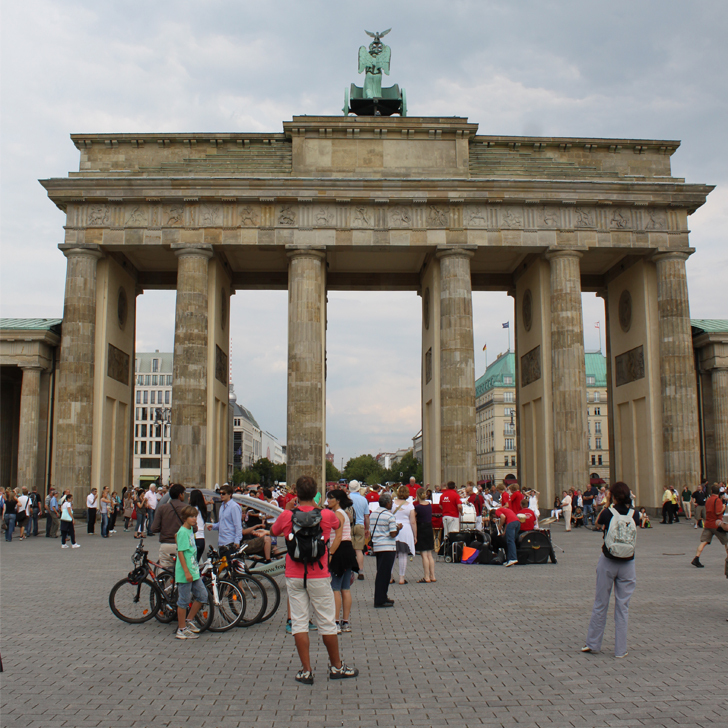 We head to the Tiergarten next, crossing it towards the ‘Siegessäule’ (Victory column), before heading back towards the Brandenburger Tor via the ‘Straße des 17. Juni’ (Street of 17th June). And from there back to the train station. Overall distance is approx. 5-6 km. So it should be doable in roughly an hour, without having to run. But also without any longer stop overs for coffee, museums or the likes. Berlin in One Hour: Go on a sightseeing boat tour. 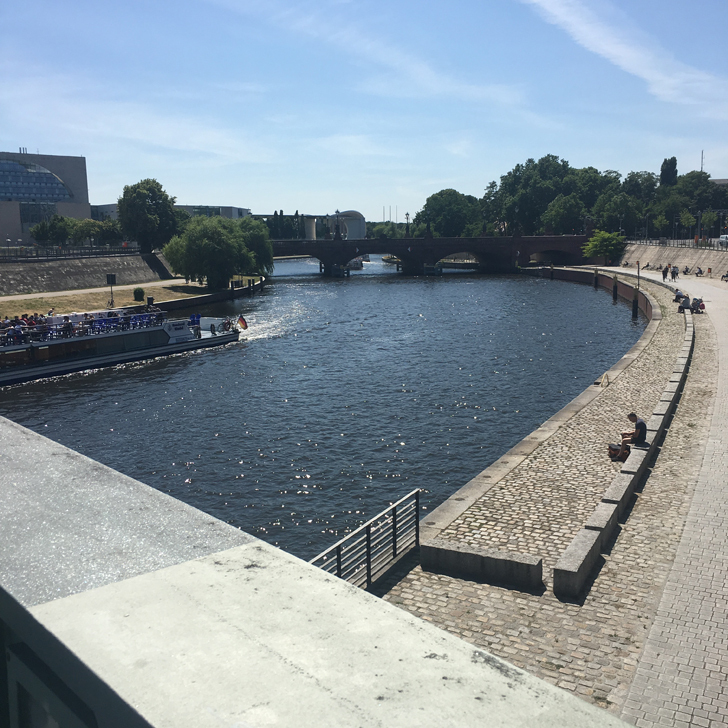 The river Spree is just behind the train station. When crossing the footbridge there is a departure point for city centre boat tours. From March until October the boats depart roughly every half hour for a 1-hour tour on the Spree, covering both the historic part of Berlin and the modern city center. Costs are €14 / adult. There are supermarkets and coffee shops in the station. 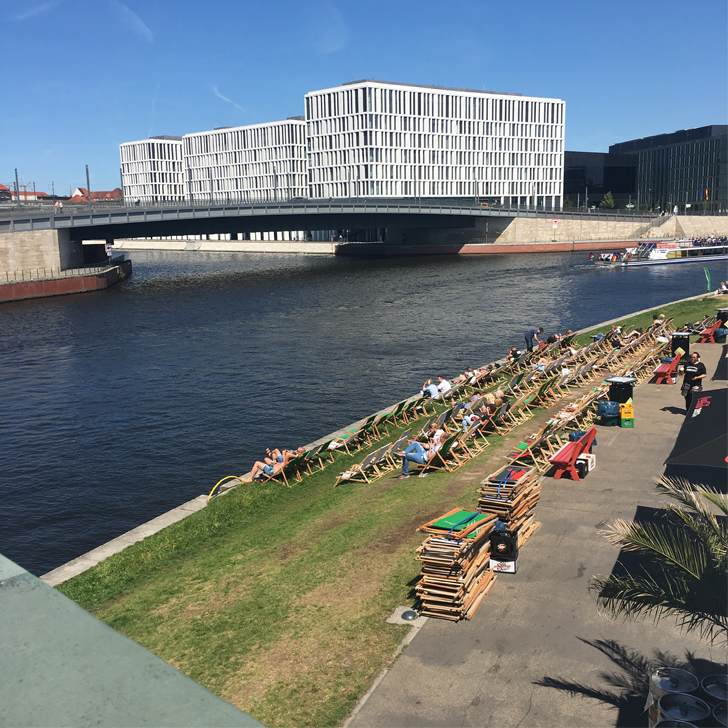 So why not grab yourself a sandwich, iced coffee or whatever else you fancy and head to the Spreeufer (Spree bank) for a picnic and a little sunbath. And if you don’t fancy sitting on the grass, there are also a few bars directly by the water, where you can relax in a deckchair with a cocktail in your hand. Perfect. 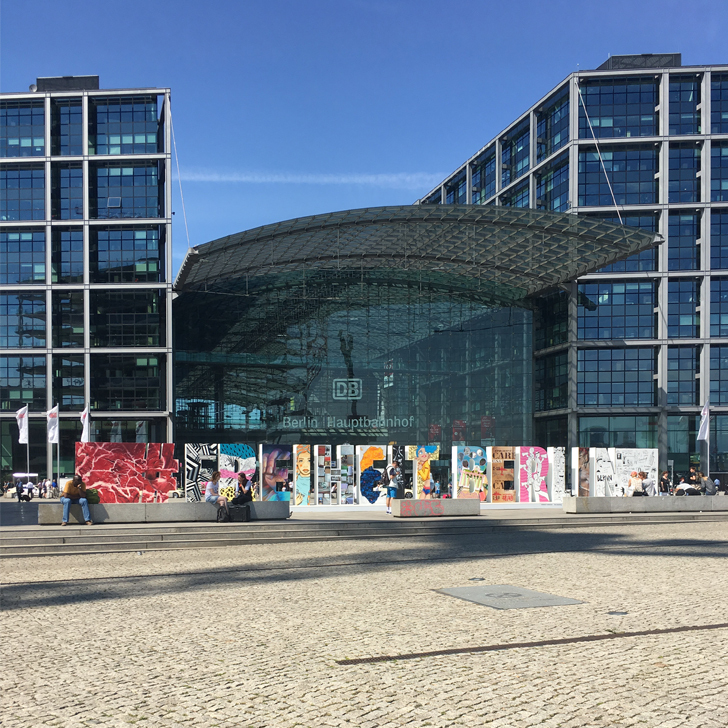 Alexanderplatz is just 1 stop away by train or tube, so you can easily head over there and hit the shops in ‘Die Mitte’ (the middle, the shopping center there). Obviously whilst you are there, have a look at the World Clock and maybe go up the ‘Fernsehturm’ (television tower) to enjoy the views, if you do have a little more time (might be a bit tight if you literally got 1 hour spare). OK, this is probably the most obvious one. There are several fairly decent restaurants in the vicinity of the station, so if the time is right, why not go for a spot of lunch or dinner. Surely not the worst idea, especially if you are heading to one of the airports. Let me tell you, the restaurants around the train station are a lot better than the ones at either of the airports (and cheaper). So tell me. 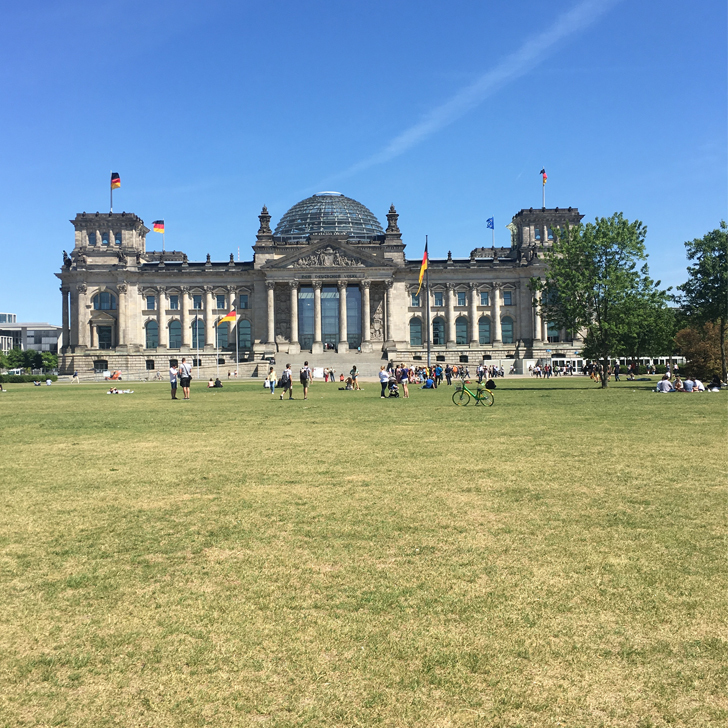 Have you had an hour spare in Berlin? What did you do? Any recommendations of your own? *all recommendations are my own, I did not receive any payment for this. This makes me miss Berlin. Always good to be able to see a lot in a small amount of time. I totally agree. Especially when I am travelling on business, I so often don’t get to see anything of the place I go. So if I do get a chance to be a tourist for a little while, I am to make the most of it.